Royal typewriters were first manufactured in the early 1900s by E.B. Hess, according to TypewriterMuseum.org. The initial Royal typewriter was later followed by two additional models, the Royal 5 typewriter and the Royal 10 typewriter, which are the most valuable. Later Royal versions varied wildly in their design and, though popular, are not prized as collectibles. Identifying a Royal typewriter is not difficult, since there are several features that distinguish it from other typewriters. Examine the typewriter for the Royal name, which appeared on every Royal typewriter. The name is located in several places, including just above the keys, at the upper back of the machine above the carriage return and on the machine sides. The " R" in the Royal name has a long flourish on the right side that wraps underneath the word and stops under the first leg of the "A." In later models, the flourish extended under the entire word or was eliminated as the name was printed in block lettering. Look for a typewriter that has gold lettering on it, found on the Royal 1 model, or silver lettering found on the Royal 10 model. All of the lettering on the early Royal machines, including the patent information, is in either the gold or silver color. Later models of Royals changed on an almost yearly basis and there is no consistency among colors used. Look for typewriters that have a entirely black body, with the exception of the lettering. All Royal typewriters prior to 1950 had a black body. The one exception is the Royal Quiet De Luxe Gold model, which had shiny gold plating on the sides, with the rest of the body being black. After 1950, the body color changed frequently and may be either brown, blue, gray or olive green. Examine the patents on the back of the Royal machine. The original Royal listed 25 patent dates, and future models listed many more. Examine the sides of the typewriter and look for beveled glass windows, which identify the Royal 10 model. There will be either one window on each side or two windows on each side. Locate the serial number on the typewriter to determine the year of manufacture. The serial number may be located on the back of the machine or on the inside, near the ribbon holder. Look up the serial number in the Typewriter Serial Number Database listed in the Resources section. This will pinpoint the exact date of manufacture as well as authenticate that the machine is a Royal. 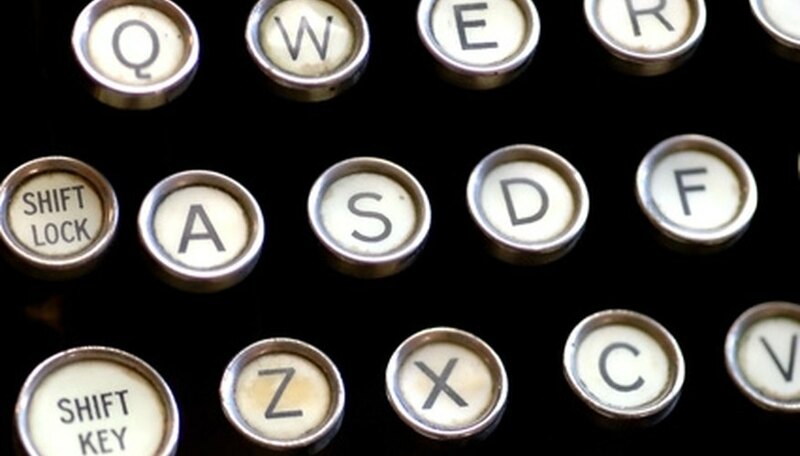 If the typewriter has the words "Royal Grand" written on it, it is the most valuable and highly desired version of Royal typewriters. Royal portables were designed in a variety of colors and designs, much like the modern-day laptop. The easiest way to identify these is to look them up in an antique typewriter directory or by serial number.